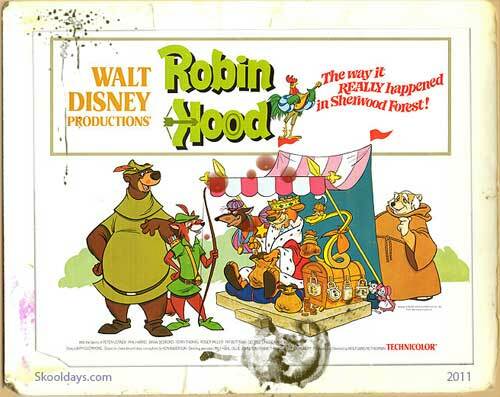 Robin Hood “the hero who robs from the rich to give to the poor” is an animated film produced by the Walt Disney Studios back in 1973. As a childhood memory, Robin Hood was a colourful delight. Who can forget Sir Hiss the snake played by Terry Thomas and Prince John the lion a real mummy’s boy often resulting to sucking his thumb for comfort. The cartoon is narrated by the rooster minstrel voiced by country singer Roger Miller. The Alan-A-Dale Rooster tells us about a Robin Hood and Little John’s adventures in England. Disney took the classic tale and gave each character a suitable animal to represent the role. Robin is a fox and Little John is a bear. They are outlaws living in Sherwood Forest. Prince John voiced by Peter Ustinov is the sitting ruling King of England. He and Sir Hiss are collecting gallons of taxes from the people to get rich while the real King of England is off on the Crusades. Lovable Robin Hood and Little John along with there merry men look to put justice back on the map. Teaming up with Maid Marian voiced by Monica Evans and her chicken companion Lady Kluck voiced by Carole Shelley, try to find a way to help Robin Hood while going behind Prince John’s back. This 1973 Disney release is adorable characters and animation, but often this cartoon animation is sidelined as it doesnt get the credit it deserves. I was lucky enough to meet Mr.Fiedler..who did the voice of “The Parson Mouse”.He was a kindly and sweet old gentleman..(Crying)I’m sorry that he left us.